I've been really getting into embossing lately. I love the shimmer and shine that it gives to a card. I also really love the process, even though it's a bit messy. When the powder starts to change under heat, it's a magical transformation. 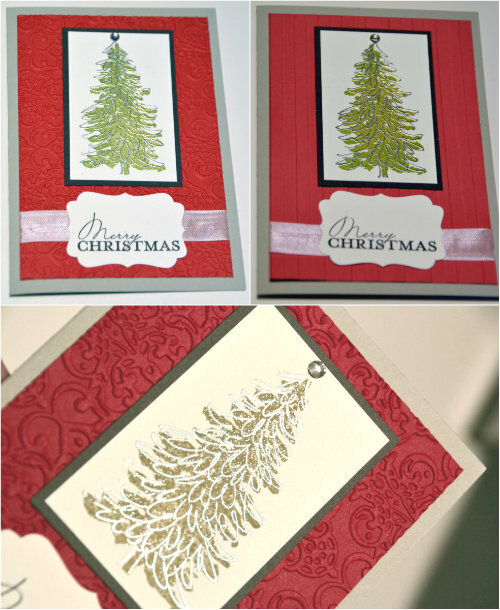 I used my bigshot agaoin on this card to emboss the backgrounds. I just love embossed backgrounds lately. There's something about the texture which really appeals to me. After adding a few more layers and embossing the tree I decided to keep the embellishments simple - just some plain ribbon and one sparkling gem to act as a star.